"The past is not the property of historians; it is a public possession. It belongs to anyone who is aware of it, and it grows by being shared." "The great potential contribution of preservation to American life is not in the saving of structures per se, but in the transformation of the values by which we live." A new in depth documentary about the social, ethical, moral, and historic significance of Pennhurst is being released - Trailer is HERE. Pennhurst Development won a $10 million state grant-and-loan package for long term re-use of the Pennhurst property. 2017 story HERE. The PMPA presentation about the need for a permanent national place of memory and learning in Washington DC is HERE. "Going Home" is the WITF Public TV sequel to "i go home" - a superb explanation of current practices and how far we still have to go - HERE. Pennhurst State School and Hospital (Images of America) by the PMPA's J. Gregory Pirmann is now available for purchase at Amazon. Join us on our Facebook page and get in on the conversation! Guests welcomed to attend in person. Or join us on Zoom internet conferencing at https://zoom.us/j/4696226100 and log in. The Mission of the Pennhurst Memorial and Preservation Alliance is to promote an understanding of the struggle for dignity and full civil rights for persons with disabilities, using the little-known history at Pennhurst. By sharing this tragic story as well as its landmark victories, we seek to educate citizens in local, national and international communities, to assure that we never go back. The Vision of the Pennhurst Memorial and Preservation Alliance is to be part of an effort to create a world-class museum to honor and memorialize the ongoing civil and human rights struggle of Americans with disabilities at a location of national significance, to assure that we never go back. There are many steps involved in each of these aspects of the mission, including collecting the stories of the people who lived here and were affected by the world-changing achievements wrought here. We invite your support of these works, which require an extraordinary amount of time and money. A range of different Membership levels are available. Donations are appreciated, and handled through safe, secure PayPal. Stay informed on PMPA news and events by signing up for our newsletter. Choose to support the PM&PA when you shop at Amazon. We have a very active Facebook community! Join Us In A Dream! Our goal this year is to invite leaders of local, state and national disability advocacy organizations representing all disabling conditions, political leaders, foundations and public figures to an organizing meeting to kick off this effort. Join us in this continuing historic civil rights journey by respecting the past as a lesson about how to create a more preferred future for more than 54 million Americans with disabling conditions and their families. NEVER FORGET …AND NEVER GO BACK! When you shop on AmazonSmile, the AmazonSmile Foundation will donate 0.5% of the purchase price of eligible products to PMPA. Every item available for purchase on www.amazon.com is also available on AmazonSmile (smile.amazon.com) at the same price. When first visiting AmazonSmile, customers are prompted to select a charitable organization. Please select “ Pennhurst Memorial and Preservation Alliance”. You will only have to do this once. You will see eligible products marked "Eligible for Amazon Smile donation" on their product detail pages. For those of you who have an Amazon Prime account, you can use your Prime account and still use the Smile website. Let Amazon help support PMPA! The Pennhurst Images of America Book Is Now Available! 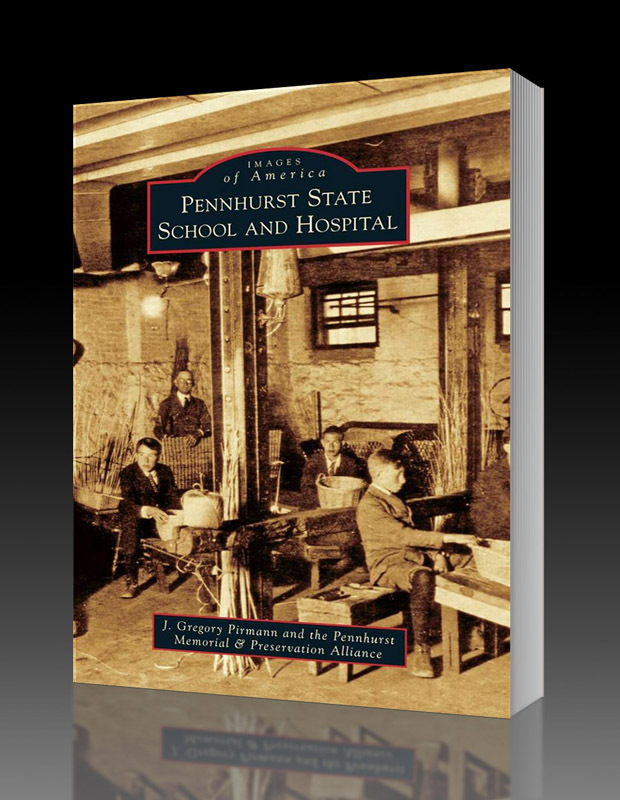 Pennhurst State School and Hospital (Images of America) by the PMPA's J. Gregory Pirmann, and published by Arcadia Publishing, is now available for purchase at Amazon! The archival images in this book primarily come from reports sent to the legislature by the board of trustees in the first 20 years of Pennhursts existence. Others have been gathered from a variety of sources, collected over the years by the author. This book provides a unique window into the separate world of Pennhurst State School and Hospital, reminding those who were part of it of what they saw and did there and giving those who know only what they have heard or seen a different picture of what Pennhurst truly was. Click here to purchase the book at Amazon Smile. Created by the PM&PA, this photographic jouney, is available in two versions. There is a 3 panel short version for smaller venues, and a 13 panel version, with a more complete history, for larger spaces. Both tell the story of Pennhurst through the tragedy, the advocacy action, and the eventual triumph of movement of all the people to community homes and lives. There is no cost to the sponsoring organization, although the costs of travel and shipping may be reimbursed. Exhibit sponsors to date have included county governments, libraries, self-advocacy organizations, colleges, and service providers, as well as the state capitol in Harrisburg, and the U.S. Senate Office Building rotunda in Washington D.C. 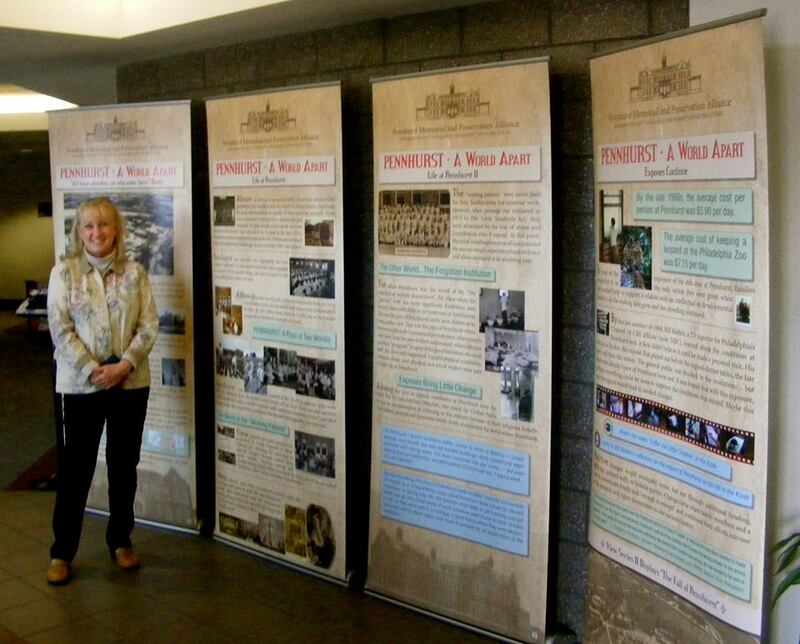 If your organization is interested in hosting the Pennhurst exhibit, please contact Janet Albert-Herman at jrherman@ptd.net to discuss details and availability. We are no longer working with a grant for this project, so we are asking host sites to consider making a donation towards mileage, replacement, and repairs to the exhibit. 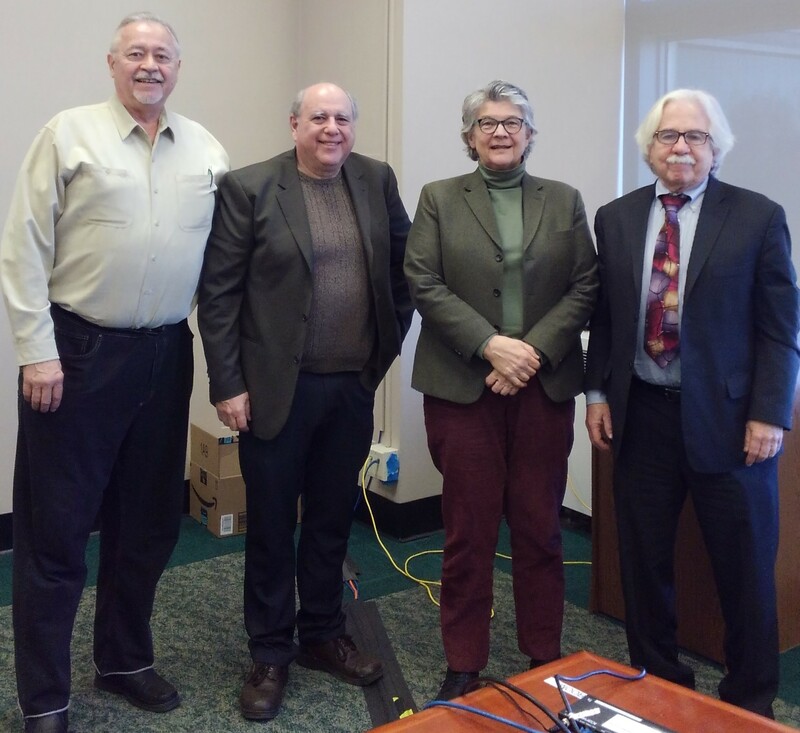 Board Members Conroy, Simon, and Friedman met with Smithsonian's National Museum curator, Dr. Katherine Ott, Curator of The Smithsonian's Division of Medicine and Science of the National Museum of American History, and Beth Ziebarth, Director of the Smithsonian Accessibility Program. Dr. Ott was also the exhibition curator for "The Disability Rights Movement," which looked at the efforts of people with disabilities, and their families and friends, to secure the civil rights guaranteed to all Americans. This exhibit physically existed in the gallery from July 2000 to July 2001, marking the 10th anniversary of the Americans with Disabilities Act,. It is now a permanent online exhibition. The meeting cemented a common goal: to work toward creation of a permanent place of memory and learning about the disability rights movement. The group generated ideas to begin the work, generate momentum, invite the entire disability community to support and participate, and to raise funds for this worthy national goal. 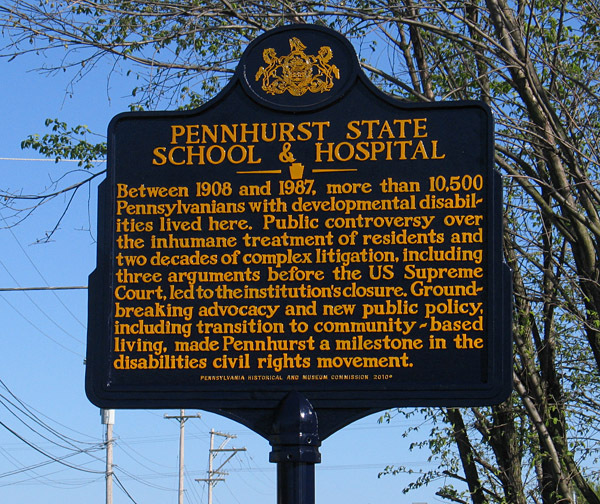 Once called the shame of the nation, Pennhurst was the epicenter of a civil and human rights movement that changed the way the world saw people with intellectual and developmental disabilities. The atrocities of neglect at Pennhurst resulted in Supreme Court litigation that sounded the death knell for institutionalization worldwide. Pennhurst stands as a monument not just to the despair of social apathy but more importantly to the bright triumph of an engaged citizenry--and the eternal hope that great change is possible from the cumulative efforts of caring people. For these reasons it must be preserved. Pennhurst was the battleground in a monumental struggle to secure basic human rights for the last group of Americans to attain privileges assumed to be the natural freedoms of all persons. Pennhurst's historic and beautiful campus is, like Valley Forge and Independence Mall to the east, hallowed ground in the struggle for dignity and self-determination, a western anchor to a freedom corridor, that, though stretching but a few miles, reaches all the way around the world. 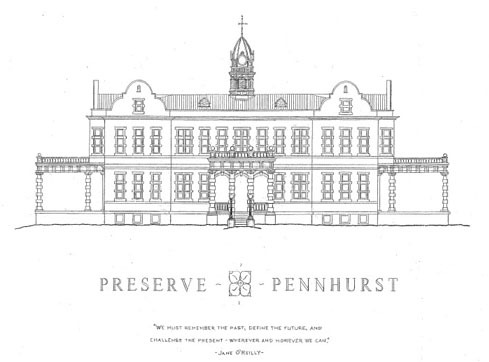 Through preservation and adaptive re-use of the historic Pennhurst campus, the Pennhurst Memorial and Preservation Alliance seeks to ensure that those achievements won at Pennhurst are neither lost nor forgotten. We seek to reclaim this once painful place as a center of conscience, healing, and outreach. This process is essential in the creation and preservation of a society where, all people are valued and respected, and where all people have the knowledge, opportunity, and power to improve their lives and the lives of others. Join us.